Did the Realtor® communicate enough? : Absolutely! Was the right information provided to assist with your decision? : Yes! Do you feel the Realtor® actively worked on your behalf? : Yes! 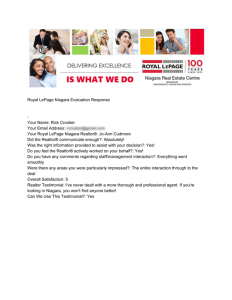 Realtor Testimonial: I’ve never dealt with a more thorough and professional agent. If you’re looking in Niagara, you won’t find anyone better!